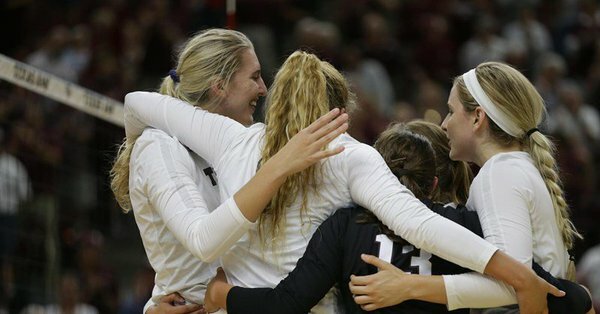 COLLEGE STATION, Texas — Texas A&M (12-11, 5-6 SEC) plays its second match of a three-match road swing Wednesday as the Aggies take on Auburn (10-11, 3-8 SEC) in Auburn. First serve is at 7 p.m. at Auburn Arena, and the match will be televised on SEC Network with Dawn Davenport and Missy Whittemore calling the action. Texas A&M is tied with Alabama for sixth place in the Southeastern Conference following a hard-fought 3-2 (23-25, 25-15, 25-22, 22-25, 15-8) setback at No. 24 Missouri on Sunday. It was A&M’s fifth consecutive five-set match as well as the Aggies’ school-record eighth five-setter in SEC play and record-setting 10th five-set match of the entire season with seven scheduled matches remaining. A&M’s most recent match that did not go five sets was a sweep against Auburn on Oct. 12 at Reed Arena in College Station. While A&M will be looking to end a four-match losing skid, Auburn will be aiming to build on its two-match winning streak after defeating Ole Miss, 3-2, on Friday and sweeping Arkansas, 25-17, 25-20, 30-28 on Sunday at Auburn Arena. Texas A&M has won the last seven meetings against Auburn and leads the all-time series, 11-1. A&M holds a 9-1 record against the Tigers in SEC matches only. Auburn’s only victory in the all-time series was Oct. 20, 2013, when the veteran Tiger squad defeated a youth-laden Texas A&M squad, 3-1 (25-23, 22-25, 25-19, 25-17) at Auburn Arena. A&M is 6-0 against Auburn in matches played in College Station and 3-1 in matches played at Auburn. In the most recent meeting, Texas A&M hit a season-high .424 to defeat Auburn, 25-19, 25-17, 25-21, on Oct. 12, 2018, at Reed Arena. Both teams entered the match looking to avoid a three-match losing skid. Texas A&M junior outside hitter Hollann Hans led all players with 16 kills while hitting .444. Five other A&M players had at least six kills as sophomore setter Camille Conner orchestrated a balanced attack, dishing out 34 assists while also pitching in seven kills. Freshman middle blocker London Austin-Roark had eight kills while hitting at a .615 clip, and she tied Hans with a team-high three blocks. Senior libero Amy Houser took match-high honors in digs with 14. Gwyn Jones and Taylor Rowland led the Tigers with nine kills each, but Auburn was held to a .188 hitting percentage. The opening set was tied for the ninth time, 13-13, before an Auburn service error and back-to-back kills by junior outside hitter Brookah Palmer and Austin-Roark marked the start of a 4-0 run by the Aggies. Auburn got within three points three times, the last coming at 20-17, but was unable to overcome the deficit as the Aggies outhit Auburn, .480 to .280 in the frame. A&M was ahead, 22-18, when Hans put down two of her five kills in the set to put the Aggies at set point. A&M then had a service error before Conner closed out the set with a kill. The Aggies jumped out to a 4-0 lead to begin the second set and kept a lead for the entire stanza. Auburn stayed within 15-12 before A&M scored four unanswered points, including a kill by Austin-Roark that was ruled in bounds after the Aggies won a challenge. With A&M leading, 19-12, the teams began exchanging points until sophomore middle blocker Makena Patterson dropped in two of her six kills in the stanza to put the Aggies at set point, 24-17. Auburn, which was outhit, .471 to .139, stayed alive with a stuff block before Hans blasted the set-winning kill. There were 10 ties and six lead changes in the third set before A&M pulled away for the win. Auburn used a 3-0 run to regain the lead, 14-12, and later scored back-to-back points to build its largest lead, 19-16, forcing A&M to call its only timeout of the match. Austin-Roark registered a kill coming out of the timeout, and an Auburn attack error put the Aggies within 19-18. Tatum Shipes got a kill off the block to put the Tigers up, 20-18, before Auburn sailed a serve out of bounds. Patterson knotted the score, 20-20, with a kill, and Auburn committed another untimely error to put the Aggies up, 21-20. The score was tied for the final time following an A&M service error, but Hans posted back-to-back kills to return the lead to A&M, 23-21. Auburn called its final timeout, but its next attack attempt sailed wide, putting A&M at match point. Hans then clinched the victory with her sixth kill of the set. Three of A&M’s four matches against ranked opponents have been decided in five sets, including narrow 3-2 SEC losses against No. 11 Florida, No. 15 Kentucky and No. 24 Missouri. A&M enters the Auburn match having played five consecutive five-set matches. A&M has played a program-record 10 five-set matches in 2018, breaking the previous record of nine five-set matches played in 1988, 2005, 2010 and 2014. With seven conference matches remaining, A&M has already played a program-record eight SEC five-set matches this season, surpassing the previous record of six five-set matches played in both the 2012 and 2014 SEC seasons. A&M has played 94 sets this season and has already surpassed the 88 total sets played in the entire 2017 season. Five of A&M’s six conference losses have been in five-set matches. A&M has lost its last four matches, marking the team’s longest losing streak of the season. Before this stretch, A&M’s longest losing streak was two matches. For the season, A&M is 6-2 in three-set matches, 3-2 in four-set matches and 3-7 in five set matches. In SEC matches only, A&M is 2-0 in three-set matches, 0-1 in four-set matches and 3-5 in five-set matches. Texas A&M is 2-3 in SEC away matches and 2-7 in all true road matches this season. A&M is outhitting its opponents, .225 to .198 in all matches but is being outhit, .219 to .217, in SEC matches only. A&M fell from 78 to 86 in the most recent NCAA RPI (rating percentage index), released on Monday. Texas A&M is tied with Alabama for sixth place in the SEC standings with a 5-6 conference record. A&M is picked to finish 8th in the SEC in 2018, according to a preseason poll of the league’s head coaches. Texas A&M junior outside hitter Hollann Hans was named to the nine-member 2018 Preseason All-SEC Team, as voted on by the league’s head coaches. All five of A&M’s SEC wins this season have been against teams that were predicted to finish above the Aggies, according to the preseason poll. A&M has two 3-2 victories against Georgia as well as a 3-2 win at LSU. Both of those teams tied for fourth in the preseason poll. The Aggies swept both Auburn and Arkansas, who were picked to finish sixth and seventh, respectively. A&M went 7-11 in conference matches last season to finish in ninth place in the SEC. A&M’s best season in the SEC was 2015, when the Aggies, despite dropping their conference season opener to Arkansas, went 16-2 to capture the SEC title, A&M’s first conference championship in program history. In their inaugural SEC season opener, the Aggies defeated Ole Miss on Sept. 14, 2012, at Reed Arena, marking Texas A&M’s first SEC victory in any sport. The Aggies went on to finish 16-4, winning the SEC Western Division and placing second overall. Texas A&M is 82-39 (.678) all-time in SEC matches only. The Aggies are 43-19 (.694) all-time in SEC home matches and 39-20 (.661) in SEC away matches. Hollann Hans now has 972 career kills and needs 28 more kills to become the 19th player in program history to join the 1,000-Kills Club. Although A&M has played in a record-setting 10 five-set matches, Hans continues to lead the SEC and is 12th in the nation with 5.06 points per set. Hans leads the SEC with 5.10 points per set in SEC matches only. Hans is third in the SEC and 18th in the nation with 0.46 aces per set. She leads the SEC with 0.52 aces per set in conference matches only. Hans is third in the SEC and 25th in the nation with 4.33 kills per set. She ranks third in the SEC with 4.24 kills per set in league play. Hans leads the SEC with eight double-doubles in conference matches and is second in the league with 12 double-doubles for the full season. Hans has posted double-figure kills in each of the last 10 matches and in 20 of 22 matches played. She has reached the 20-kill milestone a team-high 11 times, including in seven of the last 10 matches. Hans recorded the first 20-20 of her career with match highs of 22 kills and 21 digs against Tennessee on Oct. 19. Her 32 kills and 34 points at No. 11 Florida (10/5) are school records in the 25-point scoring era and broke the previous record which she held with 28 kills and 32.5 points against Penn State in 2017. Hans also set a school record with eight aces against Georgia on Sept. 23, breaking the previous A&M all-time record of six, reached 12 times, most recently on August 30, 2013, by Allie Sawatzky against South Dakota State. Hans has served at least one ace in 11 of the last 12 matches. She is second on the team in digs per set, and she proved she also can block as she recorded a career-high and match-high eight blocks—including a career-high three solo blocks— at Missouri on Sunday. Her three block solos are the most in a match by an A&M player this season. Sophomore setter Camille Conner and freshman middle blocker London Austin-Roark are the only two A&M players who have started every match this season. Conner is the only player who has appeared in all 94 sets. Conner is the only player in the SEC to record a triple-double this season. Conner had 46 assists and career highs of 13 kills and 18 digs, as well as a personal-best .385 hitting efficiency when posting 10 or more kills, in the Aggies’ 3-2 win at LSU on Sept. 30. It was Conner’s second triple-double of her career, as she was one of only two players in the SEC to accomplish the feat in 2017, having tallied 12 kills, 12 digs and 43 assists against No. 5 Penn State (Sept. 2, 2017). Conner came within one dig of posting a triple-double in the 3-2 victory against Georgia on Sept. 23. Conner is third in the SEC with 10.06 assists per set for the full season and is fifth in the league with 9.82 assists per set in SEC play only. She is second on the team and tied for fourth in the SEC with six double-doubles in SEC matches only. Senor libero Amy Houser has reached double-figure digs in 15 consecutive matches and 20 matches overall this season. Houser is seventh in the league with 3.84 digs per set for the full season. She is No. 10 in the SEC with 3.76 digs per set in SEC matches only. Houser has a team-high 508 service receptions. She also has a team-best .967 service reception percentage among players who have at least 15 reception attempts. Middle blocker London Austin-Roark enters the Auburn match with back-to-back double-digit kill performances for the first time this season, including a career-high 15 kills while hitting .440 at No. 24 Missouri. Austin-Roark, who has started all 23 matches, leads A&M with 0.98 blocks per set in conference matches only. She also leads A&M with 0.84 blocks per set in all matches. Austin-Roark had a career-high nine blocks against Georgia on Sept. 23. It still is the most blocks by an A&M player this season. Sophomore middle blocker Makena Patterson leads A&M and is ranked fifth in the SEC with a .347 hitting percentage in conference matches only. Patterson has recorded double-figure kills in two of the last three matches. Over the last six matches, Patterson is hitting .426 and averaging 2.12 kills per set. After having appeared in only one match over the first nine matches of the season, sophomore opposite hitter Samantha Sanders has appeared in each of the last 14 matches. She tied her season high and recorded her fourth double-digit kill performance of the season with 11 kills against Tennessee (10/19). Freshman defensive specialist Allison Fields, who played libero in the final set in the sweep against Nicholls, has started 20 of 23 matches and has posted double-figure digs 10 times, including a career-high 20 digs against Missouri State. Junior Sydnye Fields, a transfer from North Carolina, made the first start of her A&M career in the Missouri match on Sunday, starting at opposite hitter and finishing with five kills in four sets played. Freshmen defensive specialist Taylor Voss has seen action in each of the last 20 matches, typically coming in to serve for a middle blocker. Auburn is 10-11 overall and in a three-way tie for ninth place in the SEC standings with a 3-8 record. Auburn, No. 82 in this week’s NCAA RPI, has won two consecutive SEC matches for the first time this season after defeating Ole Miss, 3-2, on Friday and Arkansas, 3-0, on Sunday. Auburn is 4-4 in home matches, including 2-3 in SEC home matches. Freshman setter Mica Allison was named the SEC Setter of the Week on Monday after averaging 12.88 assists per set and directing the Tiger offense to a .306 hitting efficiency in the wins against Ole Miss and Arkansas. Allison is fourth in the league with 9.95 assists per set in SEC matches only and 10.03 assists per set for the full season. Allison runs a balanced attack that has five players who are averaging more than two kills per set apiece, including senior outside hitter Brenna McIlroy, who averages a team-leading 2.97 kills per set in all matches. McIlroy is fourth in the SEC with 0.45 aces per set both for the full season and in SEC matches only. Tatum Shipes, a 6-4 outside hitter, also collected conference honors on Monday as she was named Co-Freshman of the Week after averaging 4.12 kills per set. She had a career-high 21 kills against Ole Miss and had 12 kills while hitting .409 in the sweep against the Razorbacks. The Tigers outhit Arkansas, .371 to .202, and outblocked the Razorbacks, 8-3. Auburn, which tied for seventh place in the SEC in 2017, was picked to finish sixth this year according to a preseason poll of the league’s head coaches. Rick Nold (Louisville, 1998) is 118-112 in his eighth season as head coach at Auburn and 289-210 in the 17th season of his head coaching career. Texas A&M closes out its three-match road swing on Sunday, Nov. 4, with a rematch against No. 25 Tennessee. First serve against the Lady Vols is at 4 p.m. CT (5 p.m. ET) at Thompson-Boling Arena in Knoxville, and the match will be televised on ESPNU. Tennessee defeated A&M, 3-2 (25-23, 22-25, 25-21, 24-26, 15-12) when the teams met on Oct. 19 at Reed Arena in College Station.